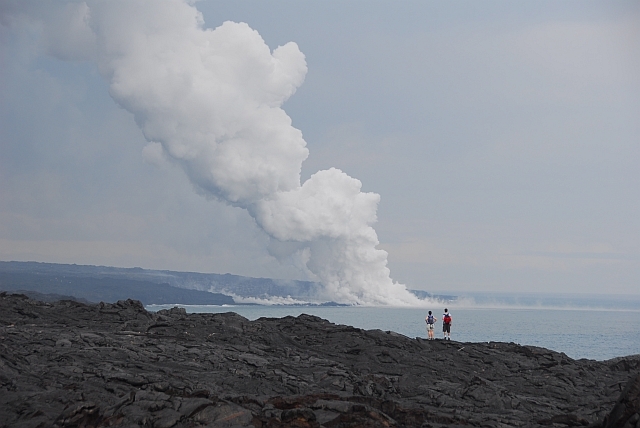 I was hiking in Kilauea to see the steam coming up out of the ocean. I was in about three miles before I could actually start seeing the plume coming out of the ocean. I saw a couple ahead of me stop and I decided to give this a go. It gives perspective of scale. I did not have the proper gear to go in any further but I am amazed that some people still live there even though the 2003 lava flow have pretty much cut them off from conventional travel. It is quite the hike in and out. I found this place fascinating. Great shot. The people certainly give this greater impact. I've hiked a tad closer but started running out of time and had to return as soon as I reached the steam rising from lava hitting the ocean. Others have gone in the evening a little bit further than I did and gotten some splendid shots with the molten lava dripping into the ocean. It takes a lot of luck to be there at the right time with enough time and stamina to get the shots of the molten lava. Wow! That's a great shot vZInquest! You captured the shot just right by having the people there. Really does give you a sense of the size. ....Don. I only resized this shot and thought the camera reproduced what it really looked like that day. I am sure I could do some PP to give this some "punch" but by itself being there was just awesome for me. When I first came onto this thread I forgot it wasn't a critique until a poster before me involved himself in it.So I erroneously picked up where he left off. I didn't think anything about it untilI dropped by a day or so later and noticed deleted information. That's when it hit home that I and the other poster, whomever that may be,had goofed. Your message was loud and clear with that deletion. Further, I apologize for the intrusion. However, I do believe a friendly reminder could have been offered as an alternativeto the sudden interruption via thedeletion method.